The first post is an overview about the emerging commons-based peer production ecosystem and start talking about fab labs and the Fab Lab network. Fabbing initiatives, taking place all around the world, are part of the emerging “commons-based peer production ecosystem”. Their primary goals are sharing designs and encouraging people to make their own goods, generally using digital fabrication tools and machines. 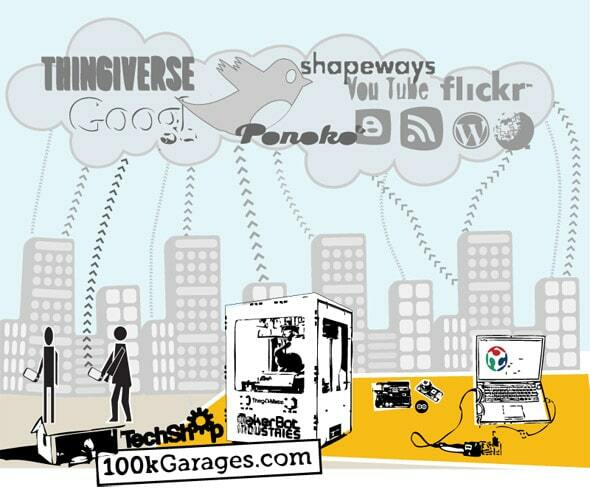 Among them we can find 100k-Garages network (USA, Canadá, Europe, Australia), Tech Shops a group of workshops in USA, Hackerspaces and Fab Lab global network. These spaces can operate in very different ways: 100k-Garages network and Tech Shops offer a professional manufacturing service whereas Hackerspaces have non profit commons based approach and fab labs could have both. Fabbers are designers, geeks or institutions that have discovered the interesting possibilities of digital machines. They are prosumers approaching these garages and laboratories to prototype or manufacture tangible objects that either they have designed or that are already available on Internet sharing platforms such as Thingiverse. Even more, in Fab lab and Hackerspace environments it would be pretty possible to learn how to manufacture and build the exact same digital machines available at the venues. Twenty years ago more than 5 universitary years would be necessary to be prepared to built a 3D printer, nowadays there are free and open manuals on the net and communities around all digital machines based on open hardware and software. The Fab Lab Network is promoted by the Center for Bits and Atoms (CBA) of the Media Lab of Massachusetts Institute of Technology. Neil Gershenfeld director of the CBA explains in the following video that fabbing and personal fabrication would mean “the third revolution”. Personal fabrication is about people’s personal expression in technologies; but it is also about people manufacturing their own goods and developing solutions locally to serve everyday purposes. It is expected that the socialization of the design and the fabrication process will bring us through important social, economical and cultural changes. In the near future the massive adoption of digital fabrication machines will bring their prices down enough to find self-made machines at home. Every fab lab has a different business model and a business plan which is related to its local agents and context. However all fab labs in the network share some organizational principles and use similar equipment. Fab labs are always connected with each other using real time video streaming so they can troubleshoot issues. They also assume the Fab Charter and share main objectives and lines of work, like the MTM: Machines That Make Machines to manufacture a group of machines that can reproduce and replicate a fab lab. Important issues are discussed at the Fab Conferences, annual global meetings taking place to discuss what is the meaning of a fab lab and what are the next steps the network should take. Hacker ethics inspire Fab Labs as laboratories of digital fabrication where it is possible to learn “hands on” by facing materials and manufacturing machines. Staff give assistants the possibility to do their own things; everything created is documented and shared with the community. One of the most popular activities taking place at fab labs is called “openlabs” where people learn from others while working and documenting. In general, although open source is not compulsory, a design born at a fab lab should be shared using an open licence. For the growth of the community knowledge it is essential to document the process. This documentation would emphasise on the problems and problem solving strategies using digital machines. This would lead to the improvement and evolution of machines’ hardware, mechanics and electronics. The ecosystem of the commons, as it happened with free software, involves a new way of seeing things through open innovation and open design. Digital production ecosystems are very interesting places for architects and designers to learn through opensource software practices. To apply this practice to designing we need to be aware and understand the constraints and opportunities the materials and methods impose. Would these labs achieve to enable a community to emancipate from the big production chains by developing local solutions for local problems? We will continue sharing approaches about the commons ecosystem and digital fabrication in next post. Bas Van Abel, Lucas Evers, Roel Klaassen, Peter Troxler, 2011, Open Design Now, available on line at http://opendesignnow.org/index.php/article/libraries-of-the-peer-production-era-peter-troxler/, accesed 5 March 2012. Manuel Gutiérrez de Rueda García, José Pérez de Lama Halcón, Nacriso Vázquez Carretero, Percy Durand Neyra, 2011, FABWORKS Diseño y Fabricación Digital para la Arquitectura. Docencia, Investigación y Transferencia, available on line at http://issuu.com/pabloherrera/docs/fabworks_2011_low_update, accesed 1 March 2012.